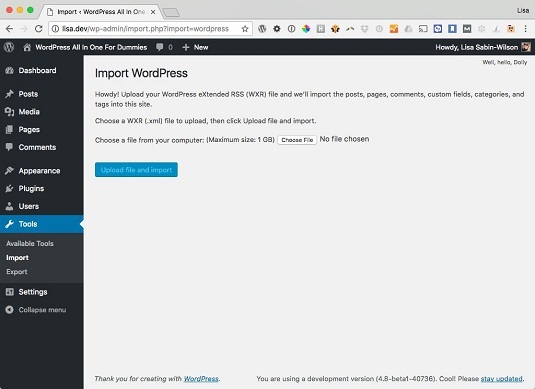 With the WordPress import script, you can import one WordPress site into another; this is true for both the hosted and self-hosted versions of WordPress. WordPress imports all your posts, comments, custom fields, and categories into your blog. Click the Install Now link below the WordPress title on the Import page, and install the plugin to import from WordPress. Click the Run Importer link. The Import WordPress screen loads, with instructions for importing your file. The import script gets to work, and when it finishes, it reloads the page with a message confirming that the process is complete. If all else fails, or if WordPress doesn’t provide an import script that you need for your current site platform, you can import your site data via the RSS feed for the site you want to import. With the RSS import method, you can import posts only; you can’t use this method to import comments, trackbacks, categories, or users. 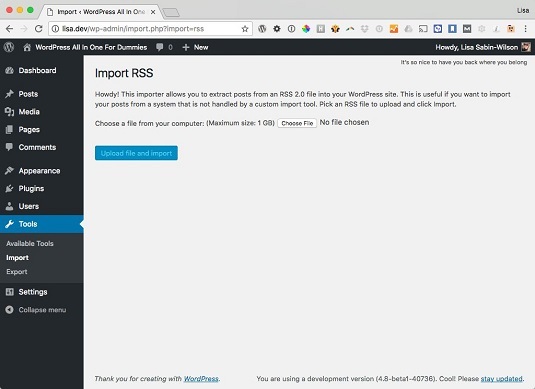 On the Import page of the WordPress Dashboard, click the Install Now link below the RSS heading, and install the plugin to import from an RSS feed. The Import RSS screen loads, with instructions for importing your RSS file. Click the Choose File button on the Import RSS page. Double-click the export file you saved earlier from your RSS feed. The import script does its magic and then reloads the page with a message confirming that the process is complete. The WordPress Codex has a long list of scripts, plugins, workarounds, and outright hacks for importing from other platforms. Note that volunteers run the WordPress Codex. When you refer to the Codex, be aware that not everything listed in it is necessarily up to date or accurate, including import information (or any other information about running your WordPress blog).